IU East student Jennie Newman answers questions during the Oral Presentations portion of Student Research Day held March 31. 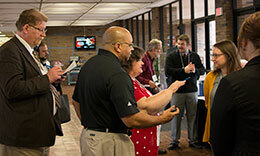 Student Research Day featured the work of 17 students at Indiana University East on March 31. The presentations included independent scholarship from courses, independent studies, summer research programs, Honors Program projects and creative endeavors.